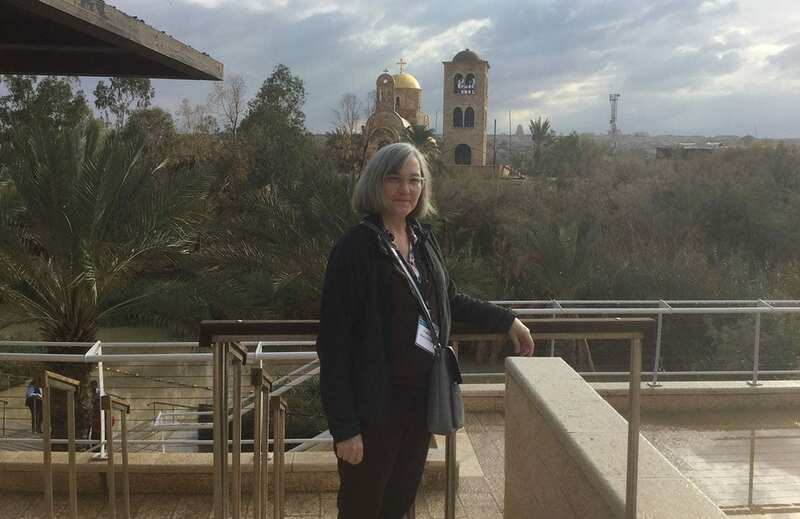 Dr. Mary O’Keeffe stands alongside the Jordan River, rear, during her fellowship trip to Israel. The river is believed to be where Jesus was baptized. An ability to embrace opportunity, a willingness to see beyond immediate struggles, and a desire to consider viewpoints different from your own are all factors in building resilience — a major component of health psychology and a subject of academic pursuit for Dr. Mary O’Keeffe, associate professor of psychology and department chair at Providence College. They also are elements of O’Keeffe’s recent experience as one of 25 professors from academic institutions across the United States selected for the Jewish National Fund and Media Watch International’s 2017 Inaugural Winter Faculty Fellowship Program in Israel. Together, the fellows spent a physically and emotionally challenging 12 days traveling throughout Israel to establish collaborations among themselves and Israeli academics and to share and develop their own research projects. O’Keeffe and her cohorts interacted with Israelis from all walks of life and immersed themselves in local culture and society. The experience included visits to historic, cultural, and religious sites such as Kibbutz Nirim near the Gaza Strip, the Yitzhak Rabin Center, the Western Wall, and the Church of the Holy Sepulchre in Jerusalem. 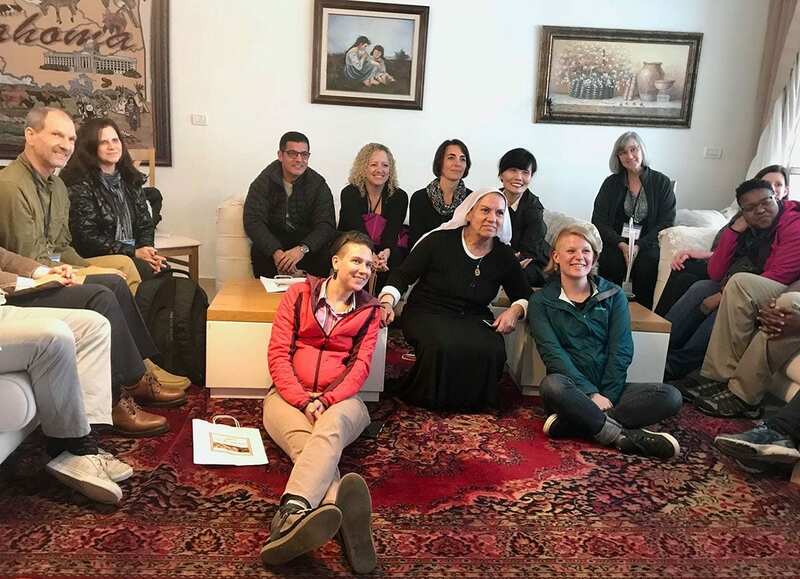 Dr. Mary O’Keeffe, sitting at rear right, joins fellowship faculty colleagues at the home of Nurah Huseyce, an Arab Israeli who owns a restaurant in the Druze town of Daliat el Carmel, Israel. O’Keeffe attributed the honor of being selected for such a prestigious program to its alignment with her field of expertise. She will incorporate many of her program experiences into a Fall 2018 advanced seminar, Psychology of Resilience. A key element of the seminar will be illustrating to students how people living in an everyday, almost constant, environment of turmoil are able to draw upon their difficult circumstances to build self-resilience and then use that as a tool to better their community. “One of the things that’s really important when we talk about health psychology and resilience is that we not only talk about research and what evidence suggests, but that my students can apply those lessons to themselves to help them be more resilient,” she said. While in Israel, O’Keeffe met several local residents who both surprised and inspired her. Among them was a female doctor to members of the Negev Bedouin, a traditionally nomadic people who struggle to integrate into society — partly because their way of life includes interfamilial marriage. Dr. Lina Alatawna, said O’Keeffe, has been able to counsel her Bedouin patients on the importance of genetic testing to reduce the risk of birth defects among their population. Another person was retired Israeli Defense Force Lt. Col. Tiran Attia, who did not let a paralyzing injury prevent him from service. He regained his ability to walk and now works with a job training and societal integration program that helps Israelis with disabilities live better lives. 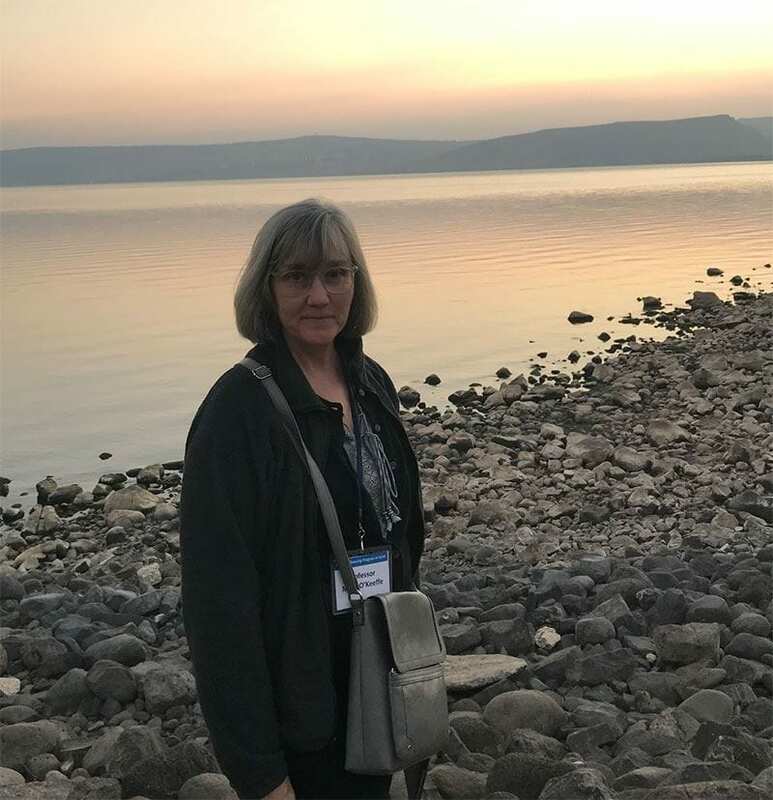 Dr. Mary O’Keeffe visits the Sea of Galilee. O’Keeffe was captivated by the story of Ibtissam Machmid, director of a non-governmental organization promoting peace. Machmid has twice run for city council in the Arab community of Fureidis. While she has not yet won an election, her personal victory — gaining the support of her husband and family — continues to inspire her efforts to improve the lives of Israelis. The fellowship also offered O’Keeffe the chance to create connections with faculty from several academic institutions throughout Israel. She was “honored and humbled” that so many distinguished scholars gave their time to offer tours of their facilities, discuss their work, and explore the possibility of future research partnerships. O’Keeffe anticipates future collaboration with Dr. Shoshi Shiloh, a health psychologist at Tel Aviv University whose research focuses on the role of information, control, and individual differences in post-surgical outcomes. O’Keeffe, who has been teaching at the College for 27 years, found her academic focus early in her career. As a young professional, she researched medical psychology. At the time, it was a new concentration in psychology — there were only three applicable doctoral programs offered in the United States — and she found her niche training as a stress researcher. At the same time she was finishing her doctorate at Uniformed Services University of the Health Sciences in Bethesda, Md., PC was seeking a health psychologist to join its faculty. O’Keeffe’s students also will benefit from what she learned about herself, and building her own resilience, during the fellowship. The trip was only her second international travel experience. She said she was delighted to be part of a very diverse group representing academics from a wide variety of disciplines and ages. Lively conversations with the other fellows, whose fields included engineering, music, and the sciences, offered her new perspectives on applying lessons of resiliency to academic areas outside her own. And, keeping up with the rigorous itinerary, trying new activities, and allowing herself to discover new inner strengths made the experience that much more satisfying.